Special guest star: Fanboy rage over a Final Fantasy movie. In Norse mythology, Fenrir is, well, a giant wolf. He is the son of Tom Hiddleston Loki and the giantess Angrboða and brother to Hel and the serpent Jörmungandr. Prophesized to be the one to kill Odin during the events of Ragnarok, Odin ordered Fenrir be bound. Telling him it was a test of his strength, the first binding they tried was too weak to hold Fenrir and he managed to snap it easily. The second was stronger, but he manged to break it as well. Finally, Odin sent the messenger Skírnir to the land of Svartálfaheimr to have a third binding made by the dwarves. This one, called Gleipnir, was as smooth and soft as silk, but strong. When Skírnir returned with the Gleipnir, the gods took Fenrir to the island of Lyngvi. They presented Gleipnir to him and ask that he tear it, passing it among themselves to show how strong it was. (Finally) sensing trickery, but unwilling to step down from the challenge, Fenrir told the gods he would allow himself to be bound, but only if one of the gods put his hand in his mouth as a sign of good faith in case he was unable to remove the binding and they failed to remove it for him. At this, the gods hesitated until Týr, son of Odin and god of law and heroic glory struck his right hand in Fenrir's mouth. After Gleipnir was was placed on him, Fenrir tried with all his might to break it, but with every action the bind grew stronger. After the gods laughed at his predicament, he proceeded to bite of Týr's hand at the wrist. They tied some of the cord hanging off Gleipnir to a large stone slab deep in the ground, making sure Fenrir could not escape and seek help. To keep Fenrir from trying to bite them, they shoved a sword up through his mouth. There, on the island of Lyngvi, bound by Gleipnir, is where Fenrir will lay until Ragnarok when his binds will break and he will join at the battle of Vígríðr, and eventually kill Odin. In Final Fantasy, Fenrir is, well, a giant wolf. Currently, he has appeared in three Final Fantasy games. In Final Fantasy VI, when summoned, he casts Image on the party, increasing their evasion rate. In Final Fantasy IX, he has two attacks depending on his summoner's, Eiko's, equipment. If she has the Maiden Prayer's accessory equipped, he uses the wind elemental attack Millennial Decay. If not, he uses the earth elemental attack Terrestrial Rage. He is also a summon in Final Fantasy XI, where he has a number of different skills he uses when summoned, including attacks and buffs. 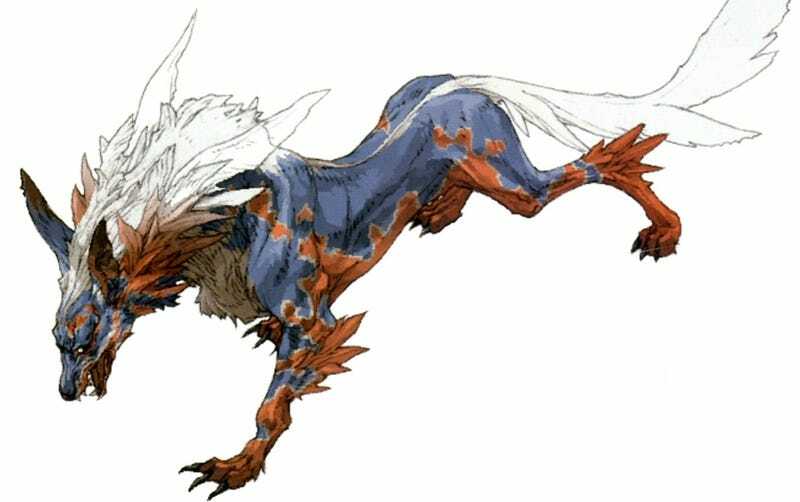 While he doesn't appear as a summon, Fenrir does have a role in the expanded universe of Final Fantasy VII (a wonderful game just freaking flooded with connections and references to Norse mythology). In the movie Advent Children (a thoroughly aweful movie that manages to insult fans and newcomers alike and throws me into fits of fanboy rage) Fenrir appears as a normal sized grey wolf, symbolizing Cloud's lonliness and grief over the loss of his friends (You know, that grief and loneliness that he mostly came to terms with in the game? That game that apparently no one involved with making this movie has ever actually played?). On his outfit (one of, like, 3 things I actually like about the movie) Cloud wears an emblem of Fenrir on one of his shoulder pauldrons. Fenrir appears in the movie a number of times, finally dissolving when Cloud, again, comes to terms with Zach and Aerith's deaths. Which he does by killing Sephiroth (again) I suppose because god knows nothing else was apparently as important to the makers of this movie as that fight was (god I hate this movie!). Fenrir is also the name of Cloud's motorcycle. So, elephant in the room, they're both giant wolves. Beyond that, Norse mythology's Fenrir and the Final Fantasy Fenrir don't really share much more in common. The mythological Fenrir was a being of tremendous strength and viciousness, while in FF Fenrir acts as a bufferer and uses magic (or summoning his own summon) to fight. But, I'm going to give Final Fantasy a pass on this. In the end, the connection between the two is there and is crystal clear. That is really all we can ask. Like Glasya-Labolas before him, Valefor comes from our favorite book of demon summoning, The Lesser Key of Solomon. Described as a Duke of Hell, he tempts people to steal and fosters good relationships between thieves. He commands ten legions of demons and is described as a lion with the head of a man or donkey. In Final Fantasy, Valefor is a giant bird-like creature with a human looking torso. She first appeared in Final Fantasy X, where she is the first summon available and the one through which we learn about one of the games coolest features, actually controlling summons after years of them just being a glorified spell. She has two overdrives (the only one in FFX to have more then one). The first is Energy Ray, attacking with a beam of light that explodes beneath the the enemy, dealing non-elemental damage. The second, Energy Blast, has her firing multiple beams of the same beautiful exploding death rays. Her Fayth, the people who willingly underwent a ceremony to have their souls sealed in statues, allowing summoners call forth Aeons, is that of a teenage girl from Besaid. In Final Fantasy X, every Aeon is associated with symbols from Yevon Script, the religious text used in the game, based on Siddham script used in Shingon Buddhism. Pictured is Valefor's seal. The symbol in the middle of the seal is the symbol associated with her. Her symbol in the Yevon Script of the game is annoted with the Kanji for mu (無), meaning nothing or null or non. In Buddhism, mu or emptiness is a concept of negation of self, selflessness, and purity of the soul; traits summoners in Final Fantasy X must posses in order to complete their pilgrimage and defeat Sin. She also had a minor appearance in Final Fantasy XIII, where a Cocoon L'cie transforms into (a significantly redesigned) her in a play during the Pompa Sancta Parade. Yeah, no denying it this time. There is no connection between the Final Fantasy Valefor and her namesake. But I say this is still okay since Final Fantasy Valefor is 10,000 times more interesting then the real-life Valefor.